“Swingin’. Cookin’. Ground Breaking.” Three words that Jeff Rupert, director of jazz studies, uses to describe Miles Davis’ album “The Birth of the Cool.” Originally produced in 1949, the album features a nine-piece band, that includes traditionally classical instruments like the French horn and tuba. However, what makes this piece truly “groundbreaking” is its emergence as the new jazz standard from the traditional ones set in the 1940’s by big bands in the swing era. 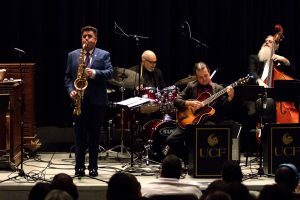 Jazz lovers in Central Florida will have a rare opportunity to hear the album performed live in its entirety when The Jazz Professors, led by Rupert, perform on the UCF Campus on October 16. The music from “The Birth of Cool” is rarely performed live because it requires a number of extraordinarily talented musicians and the cost of securing the rights to the famous music is expensive. But Rupert explains that “we’re doing this because we love music.” Although some of the music is written out, the performance is mostly improvised. “You’re going to hear solos that night that you will never hear again,” he says. Rupert will be playing the sax in The Jazz Professors play The Birth of the Cool, alongside members of The Jazz Professors, Bob Carpenter of the Orlando Philharmonic and Lyman Brodie, the Associate Dean of the College of Arts and Humanities. While the Swing era consisted of music that its listeners could dance along with, “The Birth of the Cool” ’chilled out’ the energetic music of the time to show a depth never seen in jazz. After Charlie Parker revolutionized the world of jazz forever, Rupert explains that Miles Davis wanted to create his own music revolution. Davis, who grew up listening to the music of the ‘30s, took the music of Charlie Parker and slowed it down, inviting prominent jazz players of the time to collaborate with him and create a new sound. The players, which included greats such as Lee Konitz, Gerry Mulligan, Junior Collins and John Lewis, helped develop a type of music that broke the mold on the idealized jazz of the time. “The Birth of the Cool” would later become a jazz standard that many musicians, such as Rupert, came to admire. “These guys are my heroes. They made the world a better place with their music,” says Rupert.